I can write original fiction of any length from a plot summary or screenplay. Examples can be viewed or purchased through Amazon. 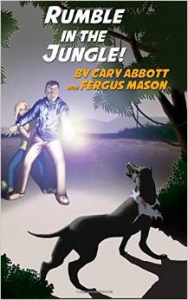 Rumble in The Jungle – Chupacabra Crisis is an adventure novella for ages 11-16. Join workaholic Ray and teen daughter Margi as they survive a plane crash, the jungle, desperate bandits and finally a pack of monsters straight out of modern legend. It’s an exciting but family-friendly tale that packs a lot of action and character development into 114 pages. I wrote this book from a detailed plot outline provided by screenwriter Cary Abbott.